Rev. 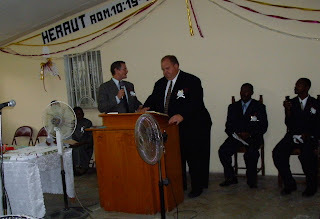 Dwight Rine challenges the graduates of the God's Missionary Church Bible Seminary in Haiti. Brother Rine is the Director or World Missions for the God's Missionary Church. Pictured are Rev. Donald Mobley (left) interpreting for Rev. Dwight Rine (right). The 2009 Graduates from the God's Missionary Church Bible School in Haiti. The other two adults in the picture are the class sponsors. The graduation service was held on the 5th of June.